We are a well-established firm that has made its presence in the industry, by supplying Suspended Platform. It is mainly used for the exterior construction and fitting out works of multi story buildings such as high rise elevator, cableway installation, granary, colliery, security inspection, large tank, chimney, dam and bridge maintenance. 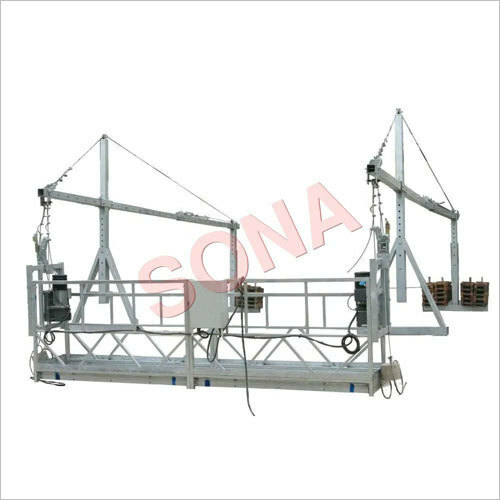 Hoist and safety lock are in mounting decks of the platform. Also, in this platform there exists balustrades so as to prevent tools inside slipping out. It comprises of surface components, railings, pulleys and head covering. Suspended Platform provides workers safer, easier and more efficient platform access.